This page is showing its age. Please update this page to fit our current standards! Info on the Japanese versions. The GameShark is one of the many cheat devices released on the Nintendo 64. The later "Pro" versions include a parallel port for firmware updates and advanced code creation, which many v3.3 units disabled to reduce costs. It also works as a pass-through NTSC region adapter by fitting all consoles or games. Some of the resources from the PlayStation version, like button icons, are still present in the Nintendo 64 version. Present at the beginning of the ROM. Present at 0x177AC in the GameShark Pro V2.0 is some development-related text. Present at 0x1A1D0 in the GameShark Pro V2.0 is some text related to the card reader found on the back of earlier GameSharks. Since Datel never released any of the cards, both the text and the card reader go unused. 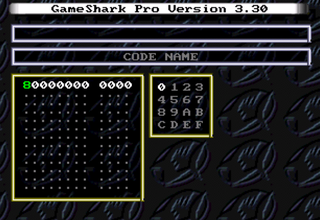 Later versions of the GameShark added support for newer games and more preloaded cheats. Pro versions added a much more detailed menu. The various revisions and regional versions have different menu backgrounds, or sometimes simply black. This page was last modified on 27 June 2018, at 21:20.